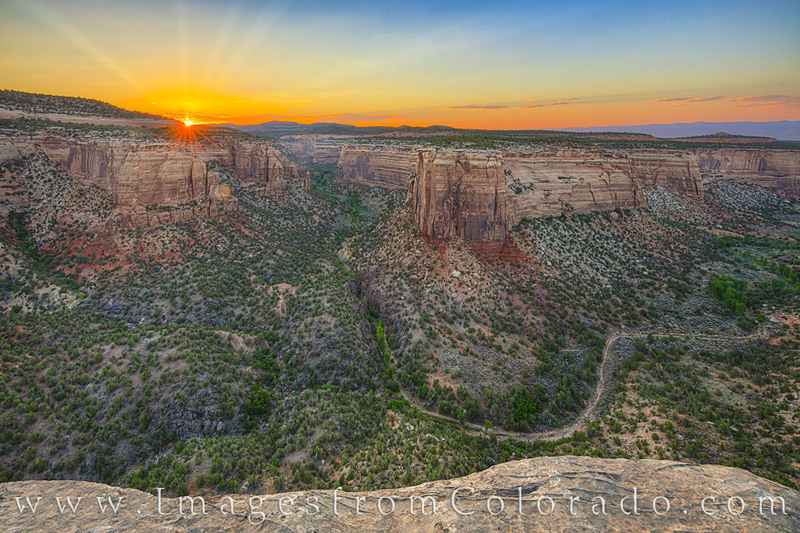 The last rays of sunshite streak up through distant clouds, bringing a glorious end of the day to Colorado National Monument and Ute Canyon. This viewpoint shows the confluence of two canyons - Ute Canyon and Monument Canyon. The trail far below is a great place to hike for a different perspective, but temperatures can be pretty toasty in the summer months. Not far from Grand Junction on the western slope, Colorado National Monument makes a great place for exploring and photographing the rugged canyons, especially at surise or sunset. Photo © copyright by Rob Greebon.